Fresh is best… and it doesn’t get much fresher than a chef preparing your meal right before your eyes. Our interactive food stalls are extremely popular and are great for outdoor events in the summer, particularly on the Jamison Valley Green. Choose a variety of stations from a carvery, sushi, fresh seafood or cuisine from around the world. 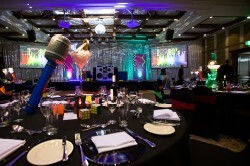 Hosting a themed gala event? Let our chef and his team design a custom menu to enhance your overall theme. 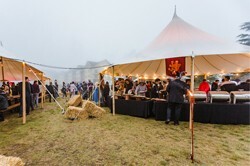 Such as a medieval inspired menu for a Game of Thrones outdoor event. Or summery delights for a garden party inspired dinner. 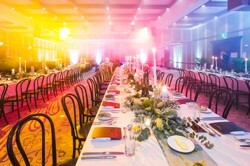 With our event production team being fully on-site, the food and event theme can be integrated seamlessly without needing to talk to multiple providers. With a World Heritage-listed National Park right on our doorstep, there are plenty of locations perfect for a picnic or brunch no matter the group size. Sublime Point (just a 2 minute drive from the Resort) is a secluded lookout with picnic tables and intimate views of the Three Sisters. Cahills Lookout in Katoomba (voted one of the best lookouts in the Blue Mountains) is only 10 minutes away and boasts spectacular views of the Megalong Valley. To create a bit of theatre and an experience for all the senses, let our chef expertly roast and serve dinner straight onto the plate. Very popular for larger groups and especially suitable for summer outdoor events on the oval. 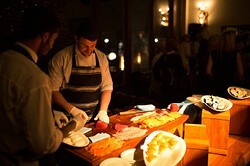 Hosting a large conference and want something different to the usual three course dinner? 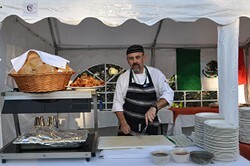 Treat your team to an impressive selection of gourmet items with a buffet in one of our unique onsite locations such as Jamison’s Restaurant, the Marquee and Tavern, outdoor on the oval or for larger events even in the hotel lobby. Breakfast is the most important meal of the day. Ensure your delegates start each day right with a full hot buffet breakfast complete stunning views of the Jamison Valley. 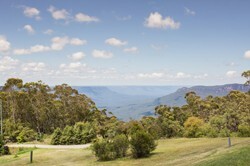 Imagine starting each day with freshly squeezed juice, nutritious omelette cooked to order and a barista coffee taking in the natural wonder that is the Blue Mountains National Park. Want to know more? View our event menus here or click here to get in touch with one of our event coordinators today.